這是透過 I2C,從溫度感應器(Thermal Sensor NXP SA56004X.). 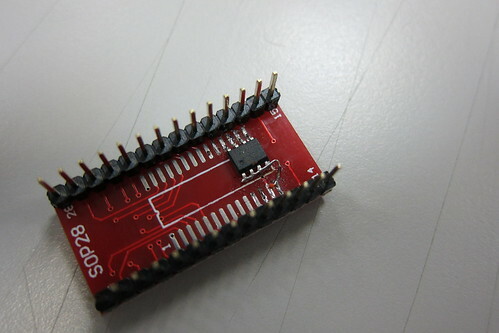 因為I2C線路的簡易(兩線)與方便(Bus上可掛多組I2C Device),所以許多電子元件多用I2C介面作設計,不過如果資料量大,速度要快就不適合.標準I2C最快速度可達400Kbps.LPC111x系列則支援FM+( Fast Mode Plus) 所以速度最快可到1Mbit/s. 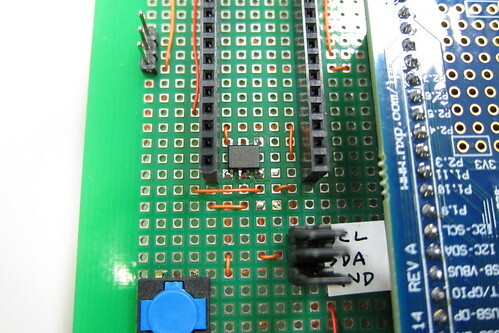 Thermal sensor實際線路接好後如(圖3).pull high resistor 在背面. 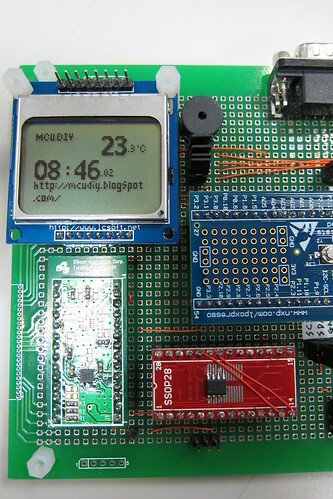 正面則是 RTC( Real Time Clock ) 不過目前還沒用到.